If your child is not talkative, pay close attention. Quiet toddlers mean something with their quietness. Is your child engaged in work, needing to remain verbally still to focus her effort? Are they not enthusiastic enough about conversation in general? Are you? Are they temperamentally quiet? Are you doing too much talking, or not enough? Get yourself to think about it. It generally helps quiet kids to gently encourage them to converse. Humor is especially helpful for the shy ones, but never mock or shame their attempts at speech. Follow your toddler’s lead, and get on his bandwagon when he’s on a roll. Narrate the scene and describe his own behavior back to him; “Sam loves to…,” or “Sam is sad his Mommy has to leave…,” or “Sam is so happy to play with his blocks.” Don’t overdo, but do. It shows your toddler that you understand him and appreciate his inner world, not just his blue eyes. Soon enough it will be dialogue. Funny as early speech may sound, don’t exploit the humor of it at your child’s expense. Whenever a new skill emerges, it is at its most raw and tender (remember your first public poetry recital?). Stuttering and stammering are normal when children are learning to speak. Treat early language with the respect it deserves. It has taken tremendous effort to get here. Say it back correctly if you figure out what it is, but don’t “correct” too much. Be patient. She won’t be saying much if her first words always are being corrected. Allow quiet play. This may seem paradoxical when language is the goal, but rest and reflection that are restorative and interesting become important when so much effort is being expended in new skill. Talk about your own feelings and how they got that way in a simple and straightforward manner. Children who have never heard their parents talking about how or what they are feeling on a day-to-day basis face an uphill climb to develop useful understandings about language and emotion. Say things like, “I felt happy to get that nice letter from Grandma…” or “It scared me when the truck got so close.” Simple, clear, and to the point. The feeling in your voice will capture your toddler’s interest, so don’t be too surprised to see her staring at you at first. It gives her the words to match the emotion she reads in you and will eventually identify in herself. Read, read, and read some more. To them, to yourself, to each other. Then talk about what you read. It is the organic garden where new words grow. Words do more than communicate thoughts and facts. They allow us to organize and categorize those thoughts and facts – just as numbering systems allow us to do arithmetic after we’ve run out of fingers and toes to count on, or file names let us access previous work on a particular topic. Children weeks old begin to bubble and coo, then move to squeals and squeaks, then repetitive tongue and lip movements, all in a fairly predictable sequence. As children age, they spend a fair amount of time experimenting and playing with sounds. They play with giggles, cooing, wailing, grunting, moaning, bubble blowing on their way to their first word, just as they play with their feet or body parts on their way to sitting up, crawling, and walking. The pleasure gained in the mastery of sounds helps drive development forward. Be honest. You know those sounds are fun to make because you mimic them just to see that little face light up. While infants begin uttering sounds for the sheer delight of doing so, they won’t attach meaning to those sounds until around 12 months. Once this happens, children discover the power of words to cause action – saying “Mama” is likely to bring Mom to the scene. 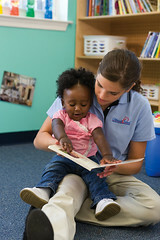 Children also discover that words can call forth mental images of the people or things the words mean – saying or thinking “Mama” will bring up a mental picture of Mom. Such images can be very comforting to a child when Mom isn’t physically present, such as at bedtime. Most parents are familiar with children’s nighttime chants, a mix of words, syllables that call up images of the child’s world that are temporarily out of sight when the lights go out. While the uttered name may not magically or instantly produce Mom, the mental image or picture attached to the name provides important comfort until she actually appears. Worries can be powerful partners in helping a child think about the world, as long as they don’t swell to flood stage and wash away the child’s coping strategies. If a child’s worries are kept to a manageable size, especially with the help of a caregiver and a few tools, they can be effective catalysts to the mastery of learning and thinking. Children need to learn to manage negative emotions, and to do that, they need to experience them from time-to-time at manageable levels. The anxiety-free child is a fantasy. Anxiety is an important warning signal for potential danger. Mastering both the anxiety and the thing or event that provoked it is a powerful learning experience. Humor and light-hearted joking around are other powerful allies in managing anxiety, and toddlers especially delight in their growing capacity to make use of it. They experiment with practical jokes by playing on their own vulnerabilities, like drooling food, falling down, or putting clothes on backwards. The raucous laughter they exhibit and elicit through their clowning is not simply entertainment, but exploration of new strategies for controlling the world of emotion around them. Has your young preschooler become less than cooperative at bath time? Turn taxing tub time into clean, shiny fun! To rinse suds from soapy hair, ask your preschooler lay down in the tub and “swish like a fish!” Or, use a small watering can to “water” your little flower as she looks up at the “sky” to avoid soap in the eyes. Remove, dry and store the toys your tot has tired of and repurpose household items into fun new tub toys. The sippy cup your child has outgrown, measuring cups or spoons all make for great entertainment in the tub—watch as your child “pretends” these items into sea creatures or experiments to see whether they sink or float. Consider replacing the “baby towels” with “big kid” towels. Many are available with ears, fins or antennae, encouraging your “baby beluga” to dry off and swim into his pjs, or your “bunny” to hop over for a bedtime story. And, don’t forget bath time “puppets”—these little terrycloth helpers can make soaping up a blast!